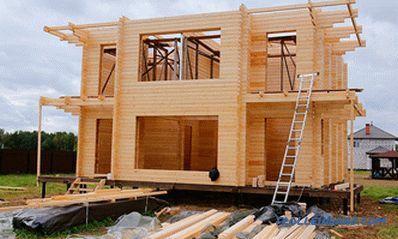 Construction of timber in the traditional way has one major drawback. The walls of such a house are too low in terms of modern heat transfer resistance. Simply put, the house is not warm enough. It is possible to sheathe walls with insulation, but in this case the house loses the color that is valued for log houses. 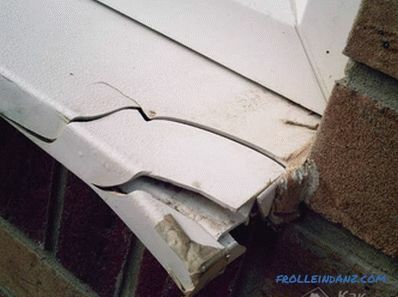 This problem is solved with the help of a double beam using the Finnish technology "Warm Home". 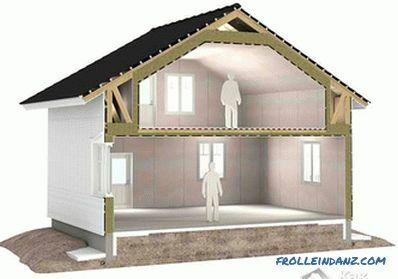 This technology allows the use of modern insulation materials, but it does not violate the appearance of a chopped house and leaves the wooden interior intact. 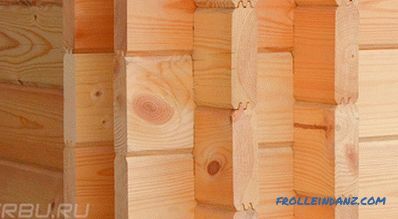 The construction technology of the double timber used the idea of ​​hollow walls. The log house is assembled from two layers of a bar of small thickness - usually from 45 to 70 mm. Between the two layers of wood there is an air gap of 100-150 mm thick, which is filled with insulation. Mineral wool or ecowool is most often used for insulation. 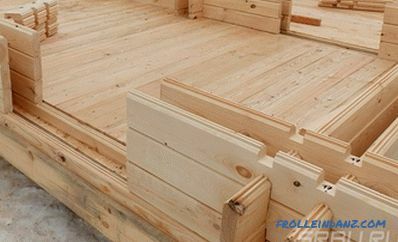 Dry profiled or glued timber is used for construction. The special profile provides a tight mate of the rims, keeps the bars from lateral displacements, makes the joints not blown. Corner and other connections take in plan the form of a lattice formed by the intersection of two pairs of parallel lines. The walls, composed of narrow boards, almost planks, have a small transverse rigidity, so long spans are reinforced with additional bridges connecting the inner and outer layers with each other. 7. The foundation of the floor. 9. Air gap for insulation. Narrow parallel bars cannot, like massive ones, dry up as part of a log house. 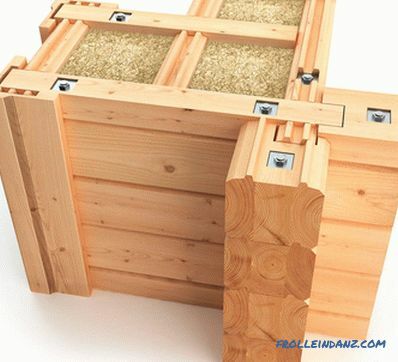 This is one of the reasons for using only high quality dry material to build. This technology is very demanding on the accuracy of cutting locks. Thin material does not forgive negligence and unnecessary gaps. Therefore, all locks are cut on special equipment. Ready-made parts are delivered to the construction site that do not require modification and on-site fitting. They are simply mounted in a predetermined manner. Dry material and high precision of connections give one undoubted advantage - it is a very small shrinkage. Usually the finished log house sits no more than 2-3%. This allows you to immediately mount window and door frames, perform final finishing and, without waiting for the end of shrinkage, put the house into operation. Externally, double hollow walls are indistinguishable from walls of massive timber. When felling with the release of the ends beyond the connection, a double end pattern is formed at the corners and end cuts. It can be left in this form or disguised as a traditional blockhouse with false issues or overlays from boards. Let's compare the thermal insulation qualities of the walls - two-layer and from a regular bar. Dry pine wood has a thermal conductivity in the direction across the fibers of about 0.15 W / (m · K). The thermal resistance of the wall of pine timber 250 mm thick, reduced to a unit of area, will be approximately 1.67 (m² K) / W.
Now let us estimate the thermal efficiency of the wall, built using double-bar technology, with 60 mm thick boards and a layer between them 150 mm filled with mineral wool with a thermal conductivity of 0.043 W / (m Вт K). The 60 mm thick board has a heat transfer resistance of 0.33 (m² K) / W. Two layers - 0.66. Let us add the resistance that mineral wool gives - 3.49, and we obtain the total heat transfer resistance of 4.16 (m² K) / W. That is, the wall of the double timber in our example was 2.5 times warmer than with traditional construction. Of course, these calculations do not take into account the effect of cold bridges and the decrease in thermal insulation qualities with increasing humidity, but even taking all negative factors into account, the difference remains impressive. It only remains to add that according to modern construction standards, the walls of residential buildings in the Moscow region, for example, should have a heat transfer resistance of at least 3.2 (m² K) / W.
These figures show that a house built according to traditional technology can be called warm only with a big stretch. The house from a double bar, on the contrary, has a good stock of thermal efficiency and does not limit its increase. Double-bar houses offer a number of advantages that have made this technology so attractive. Good protection from the cold is the main advantage of a double timber house. A detailed analysis of the thermal efficiency of such a structure was described above.The ability to impart arbitrarily high thermal insulation qualities to the walls is difficult to overestimate in the context of a constant increase in heating prices. Here, any costs pay off with a guarantee and very quickly. Compared to a massive timber house, much less wood is required for a house with hollow walls. If we take the data from our example, the difference will be 2.5 times. Hollow walls are much lighter than solid ones. 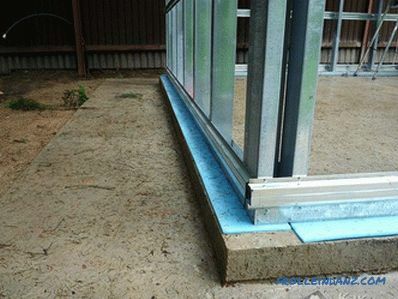 This reduces the weight of the entire structure and saves on the foundation. Under the house of a double timber can be used with a pile-screw or shallow-buried columnar foundation - structures that are economical in materials and do not require too much labor. The house from a double bar on the pile and screw base. Bar walls do not require high finishing costs. Usually they are tinted with stain and varnished. Perhaps, before this will require grinding. This technology uses planed material that has smooth surfaces that, as a rule, do not require additional processing. Double timber is a godsend for those who appreciate the characteristic appearance of a chopped house and a cozy interior surrounded by wood. The entire insulation is hidden inside, and the wooden walls look indistinguishable from the traditional log house. The disadvantages of any wooden house are obvious and well known. The construction technology of the double timber, along with undeniable merits, adds its own drawbacks, which also need to be known. Wood is a material that is subject to rotting, it is damaged by insects. And this can be a serious problem with errors in construction. Treatment with antiseptics and careful protection of walls against moisture protect them from biological damage. Wood is a combustible material. Therefore, the house from it is potentially fire hazardous. In such a house should strictly abide by measures of fire safety. 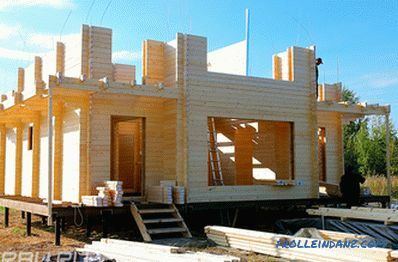 To increase the fire resistance of wood structures are treated with flame retardants - special impregnation and coatings that prevent the fire and spread of fire. 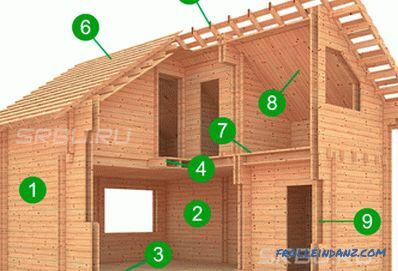 When constructing a double timber log house, it is required to make twice as many connections as in the usual way. 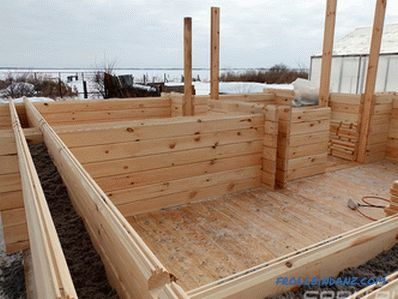 When assembling a log house, high accuracy and accuracy in work is required, which means higher requirements for the professionalism of the performers, and consequently, higher costs for paying their labor. 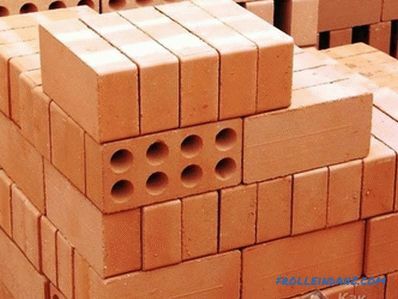 Multi-layer walls, composed of materials with different thermal conductivity and vapor permeability, need protection from water vapor diffusion. Gaseous moisture penetrates them from the inside and, moving outward, can condense, which causes unpleasant consequences, starting from the increased thermal conductivity of the walls and ending with an increase in the likelihood of rot and mildew. Because of the possibility of condensation of moisture in the walls, ecowool is recommended as insulation. This material is made from vegetable fibers - waste paper and textile industry. Due to its fine fiber structure, ecowool is able to accumulate a large amount of moisture without transferring it to the liquid phase and deterioration of thermal insulation. However, in this case, there remains the danger of wetting the outer layer of the wall. The use of modern heaters requires additional costs. However, this circumstance can be considered a disadvantage only conditionally. Part of the cost is offset by a smaller amount of wood, and the rest will be returned in the form of savings on heating. A double-bar construction technology demonstrates a modern approach to solving construction problems. This approach consists in the active use of compositions from materials with different and often opposite properties. For most composites, walls from a double beam are distinguished by the fact that structural and heat-insulating materials are combined into a common structure directly on the construction site. On the one hand, this increases the complexity of walling, and on the other, it makes it possible to freely combine the available materials and select the most effective combinations. 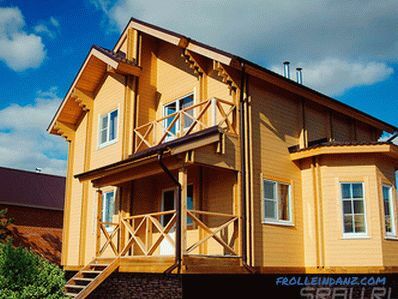 Double timber is a good way to make a house warm, but to preserve the external and internal color of the log house, to obtain the desired design and architectural effect without sacrificing thermal efficiency.